Welcome to the free Michigan Art Fair Calendar with info on the top Art Shows and Craft festivals in Detroit, Ann Arbor, Birmingham, Pontiac and Charlevoix and many other communities throughout the state. Want to know the inside scoop in the world of art, art fairs & artists? 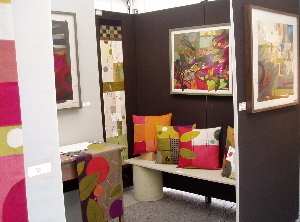 Then you will want to visit ArtFairInsiders.com, the blog. Show of the Month: Art Rapids! Just as the summer season is heating up appears this third year event, one day only, a juried fine arts event held on the shores of Grand Traverse Bay. In this beautiful setting for an art fair you are invited to stroll the galleries and shops of this arts-oriented village and find treasures at the art fair. This is a true community event put together by the residents of the Elk-Torch Lake areas to herald the summer. See June 27 below for more details. The best of Michigan's artists show up with their finest work to show the seriously shopping public. The KIA has done a wonderful job of keeping this show fresh and returning the favorite artists. A discerning jury brings you a wide variety of art and prices. Out-of-state artists vie to join us and some make the cut. High quality paintings, ceramics, wearables, sculpture and more are there to tempt you. This event is the synthesis of all that is good about an art fair. It's an easy drive to Kalamazoo and a great place to spend a Saturday. Visit the fine restaurants that surround park when you are finished shopping. It's not just an Art Fair - It's a Street Party! 12 Mile will be closed from 6 am until 7 pm between Tyler and Wakefield Streets. Attendees will enjoy strolling and shopping through Berkley’s family-friendly, charming downtown district. 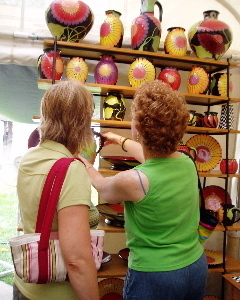 Ranked in the top 80 of art fairs nationally, according to Sunshine Artist Magazine, the Flint Art Fair has been a summer destination for over 20,000 art fair lovers throughout Michigan and Canada for the past 40 years. Presented by the Friends of Modern Art, a fundraising auxiliary of the Institute. Great pottery and that ever increasingly popular collectible, glass, in fashionable downtown Royal Oak with great restaurants nearby. A great place to finish your Saturday shopping. 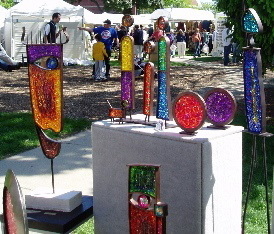 The Reeds Lake Art Festival is the only event in Grand Rapids to bring you a juried fine art fair. Don't miss it. 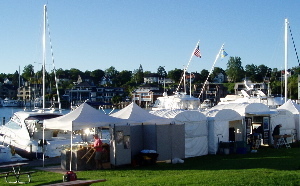 Enjoy the gentle breezes off Grand Traverse Bay while browsing through this juried art fair in a stunning setting. Elk Rapids is a charming harbor town just north of Traverse City with a growing reputation as an art-focused community. 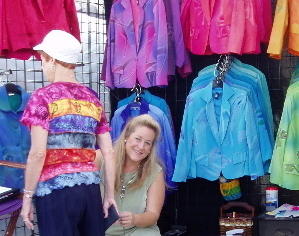 The fair is sponsored by a non-profit group of arts minded citizens and area art galleries who host the artists in this sweet one day art fair. Expect to see paintings, jewelry, glass, ceramics, sculpture, photography and all the other intriguing offerings that art fairs bring you. What else? Strolling musicians, art demonstrations, open galleries, kids activity tent. Musicians and dancers will provide entertainment throughout the day. Now doesn't this sound like a great place to enjoy a summer day? Expect a fine art show, children's activities, fireworks on Friday night, food vendors and live national local entertainment. Shop for yourself or for others at this juried fine art show in a leisurely and gracious setting. Enjoy the fabulous food court and listen to the music drifting from the gazebo. Doesn't that sound great? In the great tradition of Michigan art fairs. Free parking. 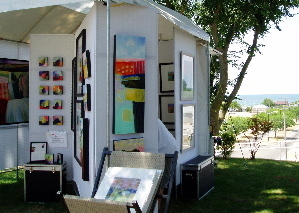 One of the state's original art fairs, held in a lovely setting along the St. Clair River, a gracious place to spend the day and add to your art collection. Easy access for all. Summer, sunshine, the river, art, music and children's activities. Let's go! Downtown Northville is immersed in Victorian charm with many upscale boutiques, unique restaurants and businesses. A lovely place to spend the day. Summer erupts all over downtown Muskegon. Several events around the city host over 500 exhibitors, including Eastbrook Homes Art in the Park, nestled among the trees of Hackley Park in downtown Muskegon. This city-sponsored art fair offers a wide variety of opportunities for artists and visitors to meet and celebrate summer. Expect stages with entertainment and a food court in addition to the artists gathered from around the country. 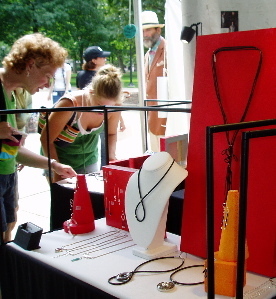 Held in a verdant park on Woodward, this unassuming event will surprise you with the quality of the art work for sale. July is the big month for art fairs in the Midwest and all the artists are working this weekend. 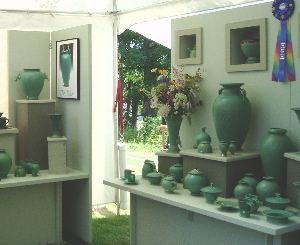 Many of the exhibitors in this fair are from out of state but they make their summer homes in Michigan to take advantage of the excellent venues to be found here. This is not one of the spectacular events, but a quiet place to shop and make some great discoveries. Arguably the most spectacular setting for an art fair. This juried fair overlooks Lake Michigan giving you a visually enthralling vista filled with creative works of art. 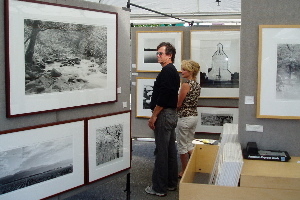 Run by the Krasl Art Center you will be seeing the artists in a setting they love in the heart of the art fair season. This well established event will show you why we love art fairs in Michigan. 10 a.m. to 5 p.m. both days. south end of Port Sanilac on M25 in Michigan's Thumb Area. This enticing extravaganza of art is officially divided into four events, listed below. In addition to this, every square foot of outdoor space in this area has been sold to people who did not jury into these four events. If there is something you have been hankering for, you can find it in Ann Arbor in July. People come from around the country and some shop all four days. Customers here for the first time are awed by the quantity and the quality of the creativity and vow to return next year. Come to add to your art collection, come to see the best in contemporary art, come to start your collection, you will not be disappointed. Parking: The easiest way to avoid the traffic is to head to Briarwood Mall, on I-94, and take the shuttle to the fairs. Or, you can arrive early. There are a lot of parking structures adjacent to the exhibit areas that are full by noon (or sooner). The evenings are also a great time to shop and the nearby parking is easier to find in the downtown. 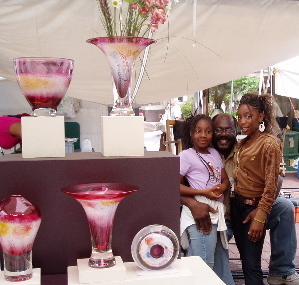 This is the original art fair that started the whole event. Established in 1959, it is highly juried - over 1000 applicants apply for the 190 spaces. The most avant garde work will be exhibited here, as well as many artists who rarely exhibit their work outdoors. Townie Street Party on Monday night in the Street Fair area, near the Bell Tower. Held in the area where the Street Fair was originally, this event organized by the local merchants has very high standards and some outstanding artwork. 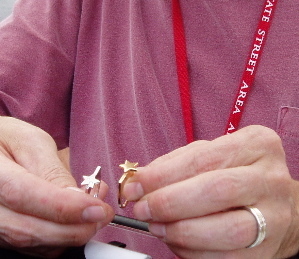 This fair, coordinated by the State Street Area merchants, has been around since l963. It is located on Liberty, Thompson and surrounding areas. Often you will find newcomers to the world of art fairs exhibiting here...the stars of tomorrow! Organized by the Michigan Guild, an artists organization, this show has the widest range of price levels of any of the Ann Arbor events. Uneven quality, it has some of the best in the show and some of the worst. It is easy to shop on Main Street with nearby parking and a plethora of restaurants. Northern Michigan in summer is paradise. Nestled again Little Traverse Bay Petoskey is at the epicenter of laid back yet classy living. Not to be outdone by the beaches and water sports fine stores, world-class restaurants and lodging have sprung up to entice you back again and again. If you are vacationing in the north this is a great event to visit. Artists looking for a great place to spend their summer head here to share their goods in a beautiful park on the shores of Lake Superior. Presented by the West Saginaw Civic Assn. This is without a doubt the best show of the year in the northern part of the state. In a beautiful setting on the harbor on Lake Charlevoix. Do head up north...always wonderful weather, as beautiful as Michigan can be in the summer. Add to that a fine quality show of excellent art. Charlevoix gets many applications and can afford to be picky about their choices. Artists like to be in northern Michigan too and you'll find the best of them here. This popular event brings the collectors out early, browsing through the show for the treasures before the artists are ready. Well run and lots of fun. Held in a beautiful municipal park, people flock to this popular event to collect the wonderful art assembled there. The rest of the event is open until 11 pm. Arts, Beats & Eats is unlike any other art show in the nation. A multifaceted event that features great food and entertainment, it also has a jewel of an art fair. The art is some of the best, 150 artists culled from over 800 applications. Many of the artists make this their last northern show before they return to the southern tier of shows. It is the last serious art event of the season. The art is in a separate area to insure a more tranquil art experience, surrounded by upscale sponsors, accessible parking and other amenities to make the area attractive to the serious art collector. No longer will you have to navigate through the crowds there for the food and music. You'll find it on North Saginaw with many parking lots in the area and the shuttle dropping off nearby. You will love this new art area...good food, cultural stage and all the excitement that this event brings to the Detroit area. Make no mistake though, in other areas you will find all the venues that has made this event the most popular in Michigan--food, music, kids activities, even drive a new Chrysler. Part of Northville's Victorian Festival and a fundraiser for the Northville Arts Commission. Shain Park plays host to the original Detroit area art fair to benefit Common Ground Sanctuary. This is a lovely park with excellent artists. If you haven't had your fill of art fairs for this season you must attend this event which has a strong reputation among artists as the place to be on this weekend. Good food, kids activities and music will round out your visit. The Fallasburg Fall Festival is a unique event that develops the potential of its' extraordinary historical setting. It is held in a beautiful park with an old schoolhouse, a covered bridge and takes advantage of this lovely setting to present a small art fair that just suits the setting and its' community. If you want to spend a fall day outdoors, shopping for art, eating homemade food from local churches, watching artisans create craft objects...I'm telling you this is the perfect place. 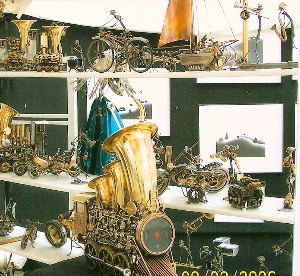 There is art for the sophisticated as well as the craft admirer. Pick up a fine etching or a dried flower wreath for your front door. This Art Walk is for You, Art Lovers & Appreciators! Visit art spaces and see what local artists have to offer! In October, pick up an Art Walk Map at any participating gallery or studio. You can also download the 2008-9 Art Walk Guide here. A old-fashioned community fall festival, besides the artists you will also find traditional fall foods, children's activities and an antique street fair. Participating downtown businesses, located primarily on Michigan Avenue, will display art pieces and host artist receptions during this event. 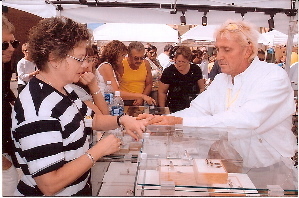 The Great Lakes Art Fair has become known for creating the ultimate event experience for both artists and their patrons! The combination of creative landscapes, exquisite food, and a premium indoor location create a bi-annual event that is quickly becoming known at the MIDWEST’S PREMIERE INDOOR ART FAIR! Just as the April show, the October show design is sure to impress. Expect a beautiful fall theme, mouth-watering cuisine, low-key entertainment, community outreach tie-ins and other special elements to come together and to create a regional marketplace that will deliver a new fresh energy to the artistic community! Shop for beautiful handmade glass beads, jewelry, ornaments, tiles and blown glass created by the S.E. 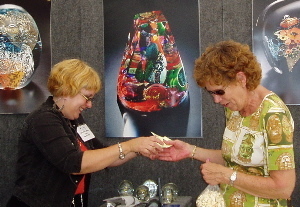 Michigan Glass Beadmakers Guild. This show features 18 local artists, hand-picked for the outstanding quality of their work. A "home show"-like setting offers a relaxed and fun shopping experience. Here is a good outing for a cold Saturday--take a friend and head over to the high school to support the artists, the parent's fundraising, have some fun shopping and find some good things for yourself. See you there! Saturday - 9 am to 5 pm; Sunday - 10 am to 4 pm 29th annual Holiday show features over 200 artists and craftspeople with unique and affordable gift items. This is the best of the best of Craft Show Holiday boutiques. Great shopping! 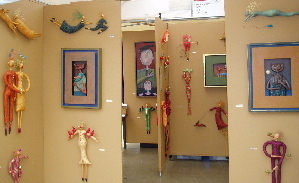 This annual Holiday Art Fair is held indoors at the Midland Center for the Arts. The Center is transformed into a holiday festival with 100 artists' booths, a Sweet Shop offering fresh-baked treats, local entertainment, Museum School faculty demonstrations, Children's Corner and a special visit from Santa Claus. 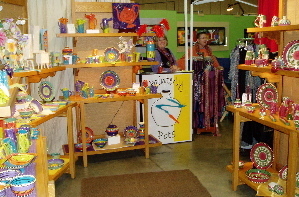 The 31st Annual Potters Market will be held December 5-7. This is the largest pottery sale of its kind in the country. 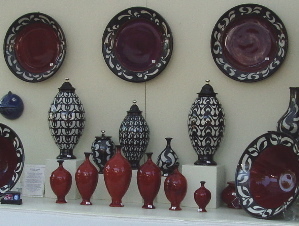 Nearly 40,000 pieces of pottery (pots, vases, platters, tiles, lamps, mugs, etc.) by over 130 potters will be for sale at this very popular event. Admission and parking are free. The sale fills every nook and cranny of the UF & CW Union Hall in Madison Heights. Lansing - Lansing Art Gallery - Holiday Art Market - Nov. 16 to Dec. 24 - 113 S. Washington Sq. Not a great month for art fairs. We recommend for your 'art fix' that you visit the galleries we listed for December. But for a serious art fix this is a great month to visit the Detroit Institute of the Arts to enjoy the effects of the recent DIA renovation and expansion which made for a significant increase in gallery space for special exhibitions. Viewing the inaugural special exhibition of paintings by former Detroiter Julie Mehretu: City Sitings would be a good starting place (November 23 to March 30). Mehretu is a truly exceptional artist whose work, in both scale and subject matter, both complement and contrast with Diego Rivera's Detroit Industry frescoes. The DIA is a great place to visit on Sunday mornings for Brunch with Bach, or a wonderful cure for cabin fever on a Sunday afternoon. And, not to be overlooked, the Detroit Artists Market, established in 1923, just down the street from the DIA at 4719 Woodward. This is always a great place to view cutting edge work and give you the opportunity to discover new artists and help them establish their careers. Open Tuesday - Saturday, 11 am to 6 pm. "Home of the Art-Rageous Deal!" Save the Date! I hope you are reading this in plenty of time to write this one into your calendar. You love art fairs, but sometimes you also like a bargain. This cool event combines the two enabling you to have fun, get out of the house, find treasures and save some money. Brought to you Bonnie Blandford (jeweler) and Michael Kifer (potter), two artists who know this marketplace and want to see you there. Remember, think garage sale and bring your cash! Come early for the best selection. Come back later for the best deals. You know you love art fairs, but did you know that artists, just like stores, sometimes have leftover inventory and/or 'seconds'? This amazing event at the fairgrounds really brings out the bargain hunters.Get there early to get the best deals in painting, photography, jewelry, clothing, ceramics, glass and more. When the funds dried up for the nationally recognized marching band of Plymouth-Canton (the top-rated band in the state and three times national champion) the parents stepped up with fund raising efforts. Therefore, lots of love and care go into making this a successful event. Corner of Greenfield and Michigan Ave.
NEW EVENT! The Great Lakes Art Fair offers fine artists and their patrons an expansive new regional marketplace that promises to bring a fresh energy to the artistic community. Its' mission is to bring a first class indoor fine art show to the discriminating patrons of the area and to become a new bi-annual destination event. Imagine walking through a fashionable downtown, surrounded by amazing art displays, while browsing past City Squares jam packed with action. Each City Square will offer something different, including plentiful gardens by our landscape partners, original performances not seen anywhere else and the Marketplace Cafe where attendees can truly feel like they are in an authentic outdoor cafe. 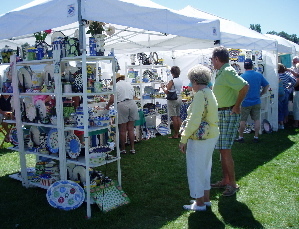 The best part is....Great Lakes Art Fair will bring you all of this without ever stepping outdoors! Rock Financial Showplace - 46100 Grand River Ave.
On Friday evening the Great Lakes Art Fair will host an opening reception for artists, their patrons and the public. The goal of this reception is to create an environment where artists and the public can socialize while raising money for a very fine cause...Detroit Public Television & Radio network. Along with entertainment, hors d'oeuvres and a cash bar, attendees will be able to stroll and purchase from the "Art on the Town Gallery" which will feature the best works of the Great Lakes Art Fair's artists. Women's Art Exhibit and sale to benefit Women's Cancer Fund, a celebration of life and art. The power of individuals working towards a common benefit. Westacres Clubhouse, 3700 Westacres Dr.
80 local artists will be showing their work inside the Westacres clubhouse and on the clubhouse grounds. In its’ 27th year this fine event heralds Spring and the beginning of the art fair season in Michigan. Sponsored by the Birmingham Bloomfield Art Association. This is the best chance for the people who live in mid-Michigan to pick up some fine art and craft in this very enjoyable festival in downtown E. Lansing, adjacent to the MSU campus. Enhanced by good food and music that complements the atmosphere, a great place to spend a spring day.